Am trying to perfect Eccles cakes and am getting close now. Have been trying for around a year on and off. This is a recipe that often gets tampered with but am doing a traditional basic recipe. Filling is: currants, raisins, butter and sugar. Pastry is rough puff pastry which is sprayed with water and dipped in sugar before baking. It also has slits cut in the top to allow steam to escape. The problem I have is that the pastry stays uncooked underneath. This is because the cake is made by folding the pastry underneath and pinching to make a pouch so the pastry is thicker underneath. I recently bought a large stone to go in my oven which I thought would help with this but it hasn't. I am still getting the uncooked pastry underneath. I heat the stone in the oven for an hour before adding the cakes which go on baking parchment directly onto the stone. This has helped with the all over texture but not the base! I tried cooking at 220c fan but the extra heat didn't work. Cooked today at 200c for 18 minutes instead of 15 as in the recipe. Am going to try cooking at a lower heat for longer unless somebody has a better idea. They are perfect except for this. I wonder if it would be better cooked on a perforated baking screen or plate, like you can get for pizza, and without parchment, so the fan heat can get to the underside easily? Hi Lance. Yes I thought that but when I tried it it didn't work for some reason. I wonder if putting them on a flat baking tray directly onto the stone it would heat the metal tray up more and cook the bottom. The video I have seen is where the baker slides a tray into and onto the bottom of a bakers oven. It could be that your filling is too fatty/moist. What kind of butter are you using in the filling? Sometimes a less fat content can help. have you tried a filling using half the amount of butter? Using no butter at all in the filling? Or using a mix of freeze dried currants powder, dried currants, dried raisins, very little butter, sugar. I think your filling is too wet. All that liquid is just soaking into the bottom crust and making it soggy. You might want to try either pre-cooking the filling first to remove some of the liquid anf thicken it up a bit or add a thckener such as lour or cornstarch to the filling so it's not so runny when it bakes. Have you checked out the online recipes to see what others do? Eg I see Hobbs House Bakery publish one; they might give you some help with your problem. There's a Felicity Cloake/Guardian one too. 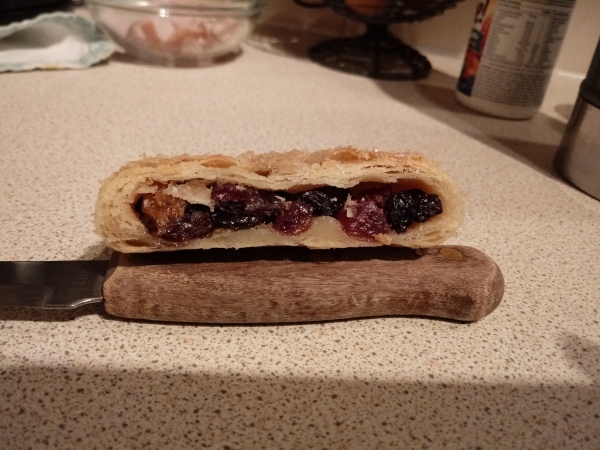 I have followed other recipes and have finally come up with the perfect tasting Eccles cake. It has the right pastry which is flaky/rough puff and the perfect filling. I followed the filling and cooking from here in my last attempt and the filing was spot on. He uses puff pastry which is not correct so ignored that. I can't really change that or it wouldn't be an Eccles cake. The pastry I went back to the original 'puff paste' recipe from 1794 and it was just right. I just need to figure out the bottom. My local bakers makes the best Eccles Cakes but it's become a bit of a challenge now that I can't give up on now. Am going to try different temperature and times next I think. I am impressed by your diligence and search for a historically correct version. The only other thought I have is to try a baking steel, known for giving its heat up to the baking piece quicker than a baking stone. I did a test today with 4 Eccles cakes. One chilled, two room temperature and one with just dried currants in. One room temp one was cooked with the others on parchment on the stone and the other one was on a flat baking tray on the stone. I also heated the stone for an hour at 200 c but then dropped the temp to 170c and opened the door to get the heat down quickly. The stone held the higher heat but I was able to cook them for 27 mins. The best one was the one with dried fruit so filling does make a difference. It also didn't taste that bad so have halved the butter and lowered the sugar for next time. Am also going to get a flat thick baking sheet to use as that made a difference. I appreciate the replies which have really helped.